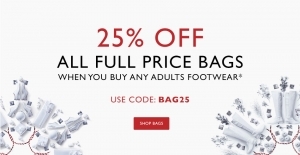 You can buy new leather, non leather, shoulder or cross body bags with 25% discount, when you buy any adults footwear. 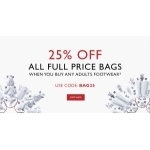 Shop online using code BAG25. Free standard delivery and free returns. The promotion is valid online until further notice.